Well as it turned out our fears were justified and, as this article in the Guardian discusses, Eurosceptic parties made significant gains. The next nail-biting moment for markets was the jockeying that occurred as Lega, Five Star, and the Berlusconi, aka Mr. Bunga Bunga, lead Forza Italia all worked to form a coalition. So far, we still lack full clarity but what we do know is that Five Star is now thoroughly entrenched in the form of Roberto Fico as the president of the Lower House. However, while the news flow has been disturbing markets have been becalmed. In fixed income, 10-year BTP yields have actually dropped relative to Treasuries. And while the Italian stock market is lower since the election it has outperformed the S&P, which suggest the driver of the fall isn’t domestic Italian concerns. Perhaps, markets are waiting to see the whites of anti-EU legislation’s eyes before they take the results seriously. However, we suspect that the real driver is the ECB’s bond market buying program, which continues to put a bid under Italian assets. PS. It appears that the ECB is running out of German paper to buy, having expanded the list of banks whose bonds it will buy to include seven more state-owned German banks. While most investors have been focused on turbulent US markets. Japanese markets have had to endure their own rollercoaster courtesy of a political scandal involving the purchase of land for a private school that has threatened to embroil the Prime Minister. These days, in the US we seem quick to write off scandal (see 60 Minutes). However, the current storm cloud in Japan is extreme and political theater of the highest order. So not only do we have falsified documents, false testimony, potential criminal prosecution but a bureaucrat’s suicide note implicating his superiors. The kicker of it all is that Prime Minister Abe has said he would resign if proof is found that he or his wife were involved with the underhanded activities. Way to go Shinzo! Fast forward to today and heat was on as a disgraced former head of the Ministry of Finance, was brought before the Diet. But the good news is fearing perjury the official refused to talk, which means Abe dodged a bullet. 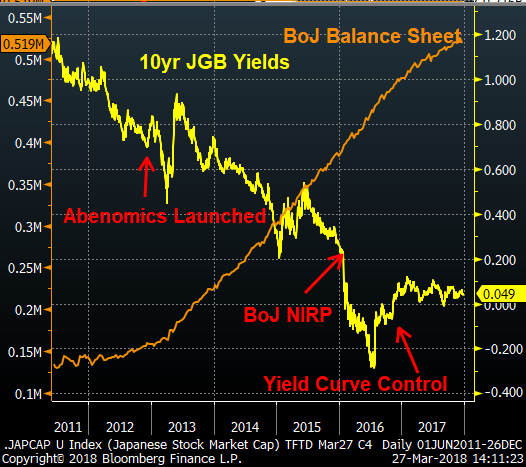 However, this story isn’t dead and what investors need to understand is, should Abe resign, it will likely signal the end of Abe-nomics as his potential replacements are all more fiscally conservative.